Do you remember Etch A Sketch from way back when? I remember it being one of my favorite toys from childhood. 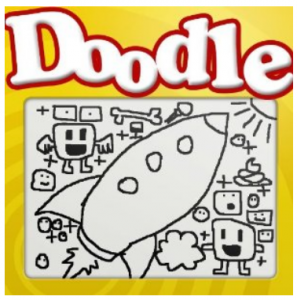 Doodle For Kindle is a worthy equivalent of Etch A Sketch, and is fun for all ages. I know there are people who can draw some elaborate scenes in Doodle for Kindle, but it is also great for basic sketches. There are some drawing included. They’re pretty cool. The Mona Lisa, a swan, and more. It would be good practice to try copying these. Your main drawing tool is the Kindle’s 5-way toggle button. there are three drawing methods: step by step, automatic drawing, and a more precise one that is primarily controlled by the drawer. The automatic one draws on its own until you tell it to stop. The step by step one is good for boxes and staircases. I had so much fun with Doodle for Kindle. In addition to bringing back childhood memories, I found that this app helps foster creativity. Sometimes the most the most haphazard drawings can become the best forms of art. For others, Doodle for Kindle might be a good way to pass time at a boring lecture, or keep kids occupied on long car rides. When I read through reviews on many different Kindle apps, I see comments about how excited they are to have kid friendly apps on their Kindle. A suggestion for future versions of Doodle for Kindle include lines that have different styles such as dashes or dots. If keyboard shortcuts are possible, they might can be used to take some pressure off of the toggle button. Doodle for Kindle has amazing reviews, and is great quality for just a dollar! This entry was posted in Kindle Applications and tagged 16 hands, Doodle for Kindle (Line Drawing on Kindle), etch a sketch by holly. Bookmark the permalink.